I'm going to check the upper left against my usual joseki sources (Rui Naiwei, Kogo's, the online sources) -- I had recalled seeing 7 somewhere if the lower right corner was mine, but not really sure if it was against a 3-4 from this direction or in some position a little different. In any case, this area seemed okay for me in the game, but I think my opponent could have done more damage to the upper middle later. 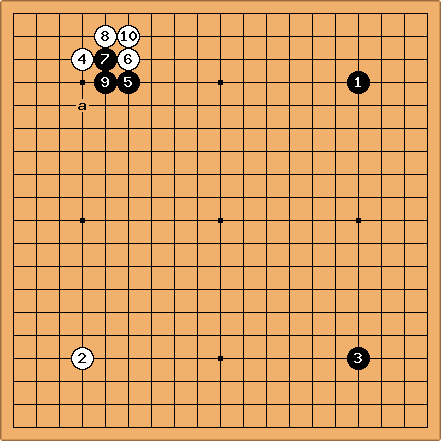 According to 34joseki, the approach at 5 is generally considered wrong... hmm... I thought I had seen it mentioned in something on the Chinese fuseki... Charles Mathew's fuseki articles at gobase perhaps? Or am I getting my variations confused again? Well, it's mentioned as 'F' in the eighth diagram of this article: http://gobase.org/studying/articles/matthews/fuseki/09/ I don't see it mentioned again in that series, though. It's not mentioned in Kogo's (version at eidogo). togo: Advancing on is a special move for chinese-like positions. It is bad in the general case. In this case there is no white stone around the middle of the left side. Uberdude 5 is bad, but 6 is worse. A better answer is to simply make the high shimari at a. White then has a strong corner, and black's stone is too close. This outside approach is indeed sometimes seen in the chinese opening as approaching from the usual direction is already pincered in that fuseki, though it is usually one space further away. That way when black makes a 2 space extension on the 4th line to help his stone it is also on the hoshi point which makes a good relation with a 4-4 stone in the upper right corner.